Spice your Life: Kid's Delight Wholesome Snacks Round up - Next theme! Kid's Delight Wholesome Snacks Round up - Next theme! Summer is upon us and we find ways to dodge it. Well almost! One of the first thing that you get to notice is the heat, then is the restless children, trying to find ways to keep themselves occupied and over anxious parents like us, trying to find ways to keep the kids occupied! Konda has still one exam to go, after which she will have her Summer vacation before the next academic starts. She is carefree to do what she wants for the next 40 days. As every time, I remember my own Summer vacation and the fun days that were, comes to mind. Parents rarely thought much on how to keep us occupied. We used to go out for playing in the morning, come back for lunch, rest for a while and again venture out. This used to be the schedule every single day. Unless we plan for a outdoor vacation. Sadly though it is no more such an idyllic scene. Kids can hardly venture out, because there isn't enough green places for them to play and it is so HOT! Parents are forced to keep them indoors and even more frustrated because they now have to find ways to keep them occupied. This is where you are going to help me! Next theme in the Kid's Delight is around finding out ways to help and give ideas to pressured parents to bang on things that they can do with kids. You want to know what you got to do? Well post some interesting crafts and other related activities that will engage kids. This may include hand crafts, hand works, just about anything that your kid does or you did as a kid. Get those ideas pouring ok! Next is about "Cooking with Kids" Now is the time you can introduce them into kitchen. Show them which simple dishes that they can prepare on their own. I have few already in mind for my daughter. So really appreciate if you can throw more ideas on this theme. So from now until May 15th, share your interesting ideas on Crafts, Simple Dishes that kids can make on their own. Post on your blog, with a link back to this post. 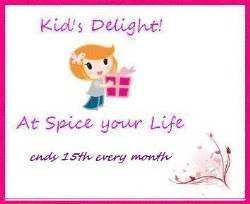 Enter your details into the Kid's Delight Form below this post! Lets now check out some really cool ideas for Snacks! 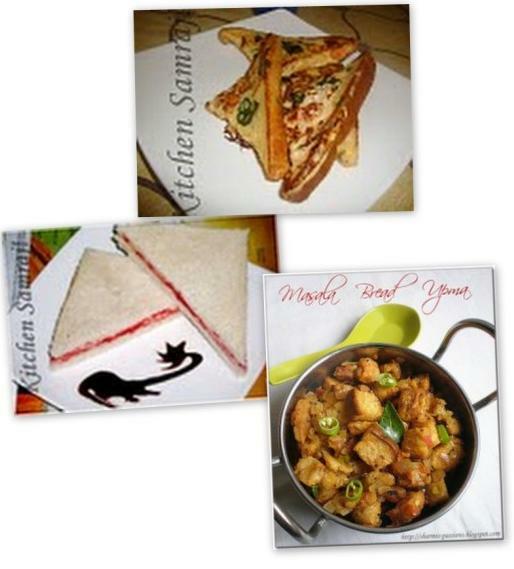 Umm razeen gives spicy twist to the sweet french toast and makes a Spicy French Toast. It works both well for a breakfast and for a bite in between! 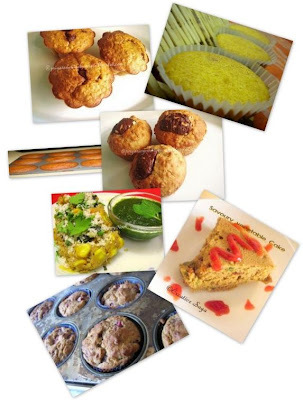 For a healthy choice, Kiran tries her hand at making a cake that is good to eat and tasty too. Check out her A ..Z Cake which is also Eggless that got done using all healthy alternatives! Reading Johanna, I felt I was running around her kitchen, trying to keep Sylvia, her daughter in place, while she bakes those tempting treats for her. Raspberry and Banana Muffins sounds way out of the world. And I am surely going to give it a try! If you want some dhokas, sorry I read again to see Madhuri referred to these Corn & Makkai ki atta Dhoklas read the lovely tale behind this snack. I can have them as a meal too! 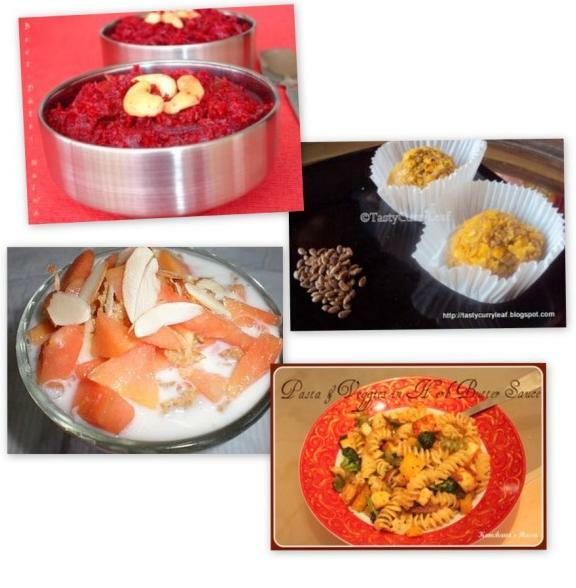 Radhika makes this Mom's Sweet Muffins one of those wonder dishes that can you help you during times you are struck for ideas! Cakes are fun but making them savory is even more! 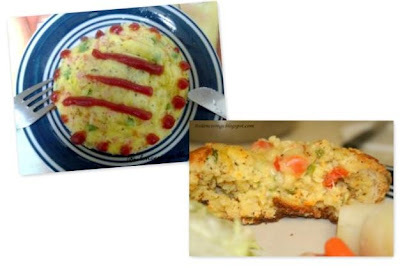 If you dont' believe, check out the Savoury Vegetable Cake from Sowmya! 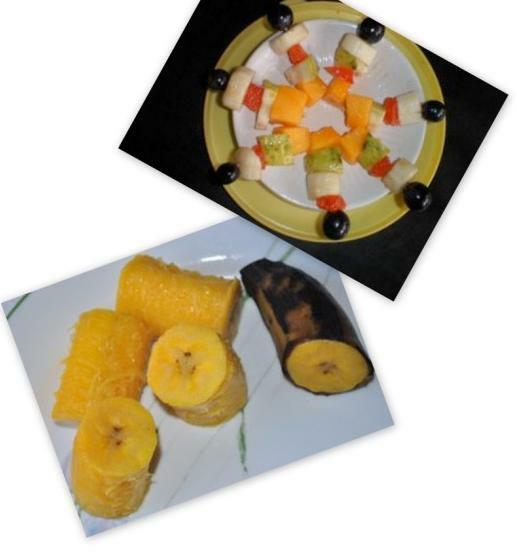 Srividhya sends in a Skewers with Fruits that kids can pack. Check out her Fruit Skewers to see how it looks! Swathi sends in this famous kerala dish the Ethapazham puzhungiyathu or boiled plantains which is packed with energy! Then we have Kamalika sending us two innovative Egg based dishes. First one is the Stuffed mini boule and the other called as the Egg Delight! Not wanting to miss out the chance of eating with her kid, Deepti bakes the best pizza thats around the corner. 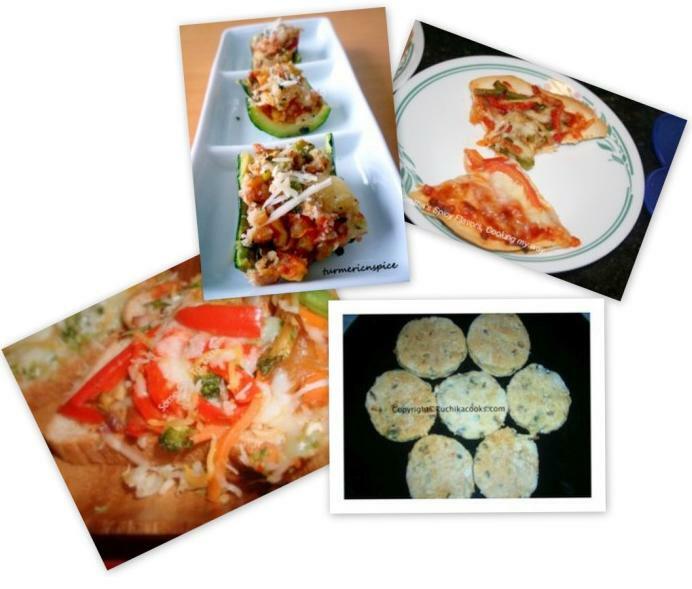 Her Wheat Bread Veggie Pizza can pose stiff competition to the other! 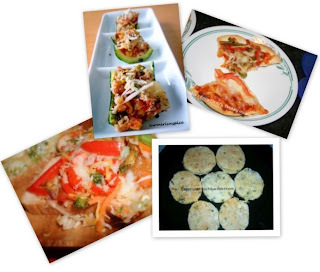 For another wonderful idea for pizza is from Smitha, who makes Tortilla Pizza. I am sure kids love this snack! Savory treats are such tempting ones. Espcially if it looks like these Onion Cookies that Sowjanya came up with! They not only satisfy your evening high teas, but fill as such wonderful dish for kids snacks! Turmericnspice says one can never feel guilty after eating this snack that they made. Stuffed Zucchini Boats are perfect for noth adults and kids alike! Sweatha had a bunch of Flax seeds and came about this very healthy snack that gets done in no time and gobbled up in no time! Sounds like a perfect snack to pack for the little ones! Protein Rich Flax Seeds Balls looks very quick. Having to whip up a quick snack in challenge that Kanchana has, she finally hits on this Kid Friendly Pasta. Srividhya sends in Fruit & Milk Parfait for Breakfast that she made. Madhuri sends in some colourful chat that serves as a perfect snack for kids. Though this may not be packed, you can still send in the content! These Sweet-potato Chat can perk up anybody! Priya Mitharwal sends in two delicious snacks that can be packed and sent. But I know they may not stay put for so long, looking as tempting as they do! 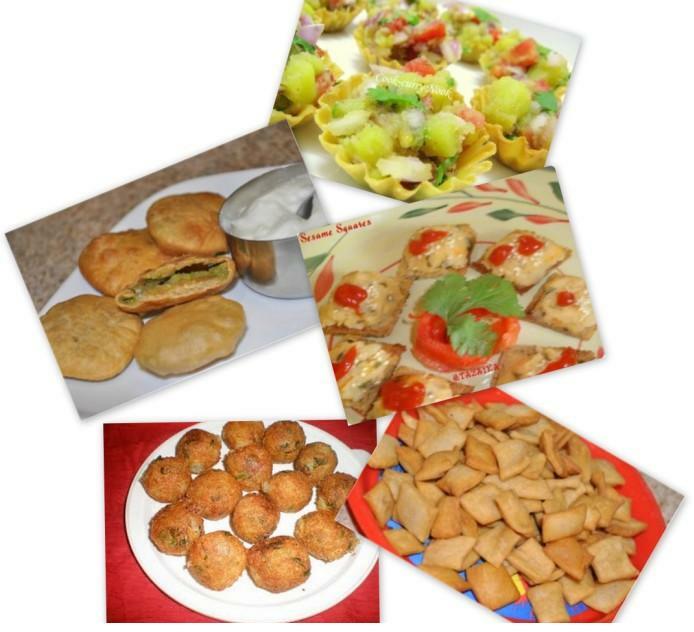 Aloo Matar Kachori & Namakpara are just perfect! Then we have Sesame Squares from Tazaika. As the lone sweet dish, Suma's Beetroot Dates Halwa makes it worthy while to drool! Moving on to some tiffin items that can be served as snacks too, we find Priya Suresh sending us Pumpkin Pancakes. Then we have Silpa sending us Moong dal dosa and a Upma to pair! If you care for a butter then these dosas are excellent choice! Butter Dosa from Srividhya sounds just right! 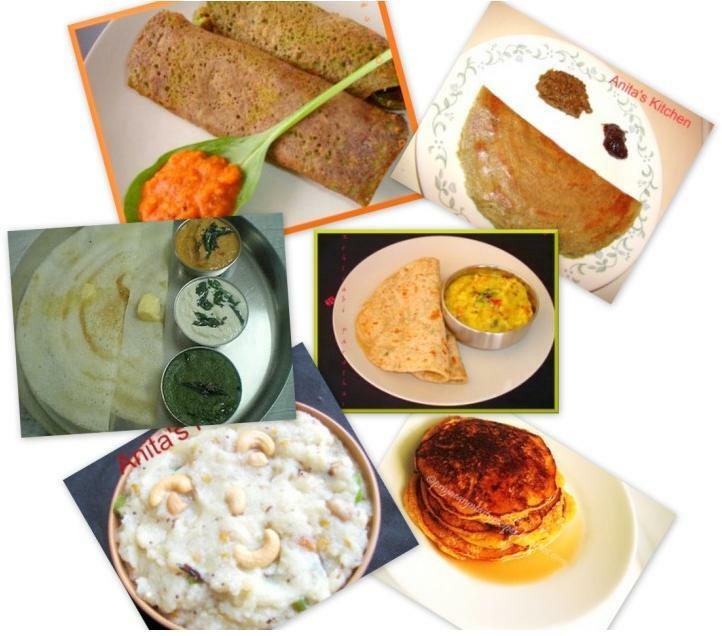 Finally we have Knolkhol Parathas and Spinach Carrot Dosas from Suma to wrap up this round up! I hope I have included everybody's entry. Do let me know if I have missed out!